Are you looking for excitement? Do you want to gain new skills and confidence? Will you be aged 16 by 13th August 2012? This could be the summer of your life! activities such as abseiling and canoeing. 2: The second week you will be based away from home and learn and develop skills YOU want to learn. in a 'dragons' style panel. see you hard work bring real joy to the lives you’re helping! 5: Graduation ceremony at…. Thorpe Park! Duke of Edinburgh and vinspired! Get involved! 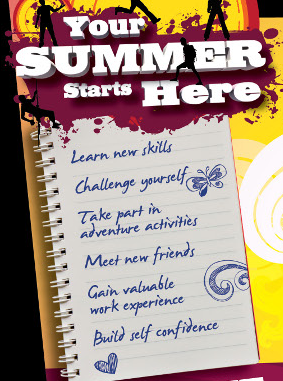 Visit www.jlgb.org/NCS or call 0208 989 5743 for more information.